We have been fielding more and more questions about “Robotic Colon Surgery”. In response to that, CSGA has put together the following to help patients and physicians understand what robotic surgery is, when it should be considered, and its advantages. Before I start, I want to let our readers know that CSGA has decades of experience in Central and Eastern Kentucky taking care of patients in need of colon and rectal surgery. We are the most experienced colorectal surgeons in our region. Each of us strives to take exceptional care of our patients. In light of this, when new technologies come along that may benefit our patients we look at them carefully and implement them in a way so that our patients get the advantages of the technology. 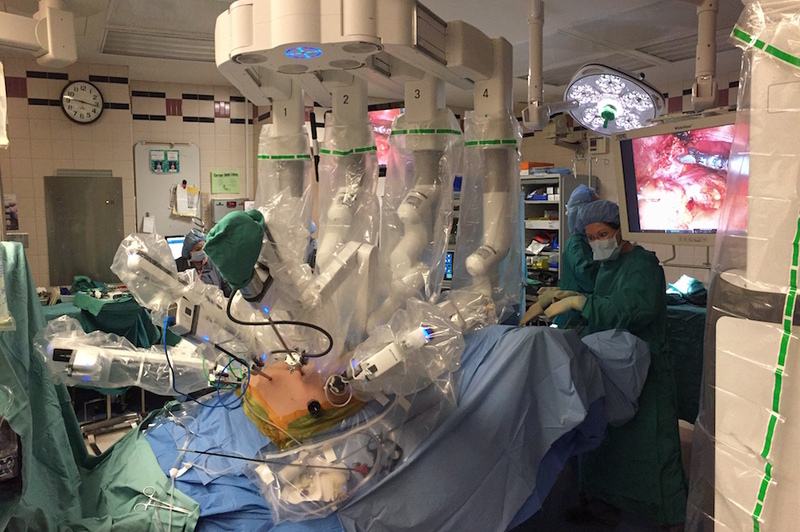 The da Vinci System represents the latest in surgical and robotics technologies. The surgeon is 100% in control of the da Vinci System at all times. da Vinci technology translates your surgeon’s hand movements into smaller, precise movements of tiny instruments inside your body. With the da Vinci Surgical System, surgeons operate through just a few small incisions. The da Vinci System features a magnified 3D high-definition vision system and tiny wristed instruments that bend and rotate far greater than the human hand. As a result, da Vinci enables your surgeon to operate with enhanced vision, precision and control. Decreased post-operative pain. We are seeing that some of our patients are not taking any narcotics for pain after surgery. In fact, our goal is for the patient to awake from surgery pain free and with only minimal narcotics given. Shorter hospital stays. Some patients can leave the hospital in 1-2 days after this procedure. In fact, over the past 5 cases, three went home in under 24 hours and the other two went home on the second post -operative day. This is in line with other minimally invasive techniques. By contrast the average hospital stay for an open colon resection is 5-9 days. Quicker return to work. Most patients who are not engaged in heavy lifting can be back to work within a couple of weeks. We still require that they do no heavy lifting (greater than 15lbs) for the first 6 weeks to allow for the wounds to heal. As with any cutting edge technology, there are costs associated with implementing the procedure. Please check with your insurance carrier if you are concerned da Vinci surgery may impact your medical bills. The surgeon will not charge extra fees to perform the operation this way, however, the hospital may charge a premium for using this platform. The operation may take more time than using other operative techniques, which means more time under anesthesia and more cost to the procedure. As a new technology, results from long-term studies regarding robotic surgery outcomes in colon and rectal surgery are not available to confirm or deny its effectiveness. It is a highly technical operation and requires a strong background and experience in not only colon and rectal surgery, but minimally invasive colon and rectal operations. For this reason, the technology is only offered in specialized centers. As a seasoned surgeon at CSGA, Dr. John Dvorak has taken the lead in developing our da Vinci surgery program and now has experience with over 50 robotic colorectal operations in addition to 13 years of practice performing laparoscopic procedures. Anyone who would also be a candidate for a laparoscopic colon surgery can be considered for robotic surgery. Previous surgery such as hysterectomy, appendectomy, small hernia repairs, or cholecystectomy would not be a contradiction in most cases. Major previous surgery will make it difficult to do any minimally invasive approach. Currently, we offer this service through Central Baptist Hospital and St. Joseph Hospital (Main Campus on Harrodsburg Road). If you or someone you know needs colon surgery and want to be considered for this new technique, give our office a call and set up an appointment. We would be happy to talk with you about it and help chose the most appropriate approach to your surgery. Are PPIs Dangerous for Me? What is ERAS and How Does it Help Our Patients? Colorectal Surgical & Gastroenterology Associates (CSGA) located in Lexington, Kentucky has a mission to provide you with the highest quality prevention, detection and treatment of digestive diseases in a caring, compassionate manner.